Home / ABS-CBN / GMA Network / Television / TV Ratings / Video / Who dominates AGB Nielsen & Kantar Media TV Ratings (Oct 9 to 15, 2017)? Who dominates AGB Nielsen & Kantar Media TV Ratings (Oct 9 to 15, 2017)? 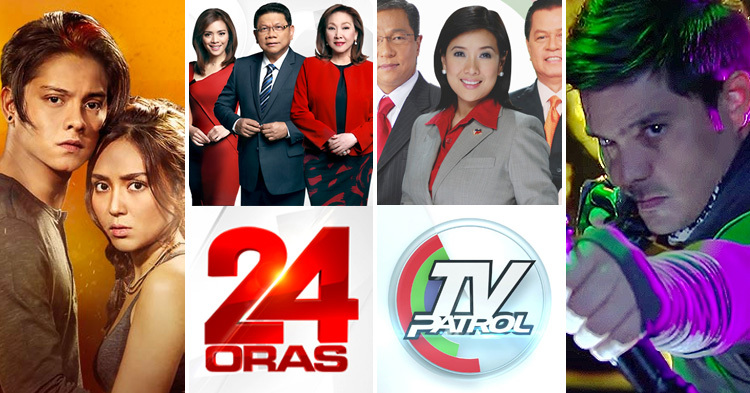 ABS-CBN continues to dominate both TV ratings survey firm but GMA7 is slowly closing in. In the latest figures from Kantar Media and AGB Nielsen for the week of October 9 - 15, ABS-CBN retained leadership as FPJ's Ang Probinsyano stayed on top of both TV surveys. Ang Probinsyano scored 41.8% in Kantar and 12.2% in AGB and remain as this week's most watch TV program. But GMA7 is getting closer as Kapuso Mo Jessica Soho trimmed Ang Probinsyano's lead to 0.5% in AGB Nielsen's results. KMJS posted an average of 11.7% for the week maintaining its number 2 position in the AGB Nielsen's ratings board. Magpakailanman also showed strong presence as it climbed to the number 4 position with 10.8% beating rival drama anthology Maalaala Mo Kaya which scored 9.3% placing 10th in the AGB rankings. While GMA7 is threatening ABS-CBN stature in AGB survey, the Kapamilya network remains dominant in Kantar as it sweeps the top 10 programs in the ranking. 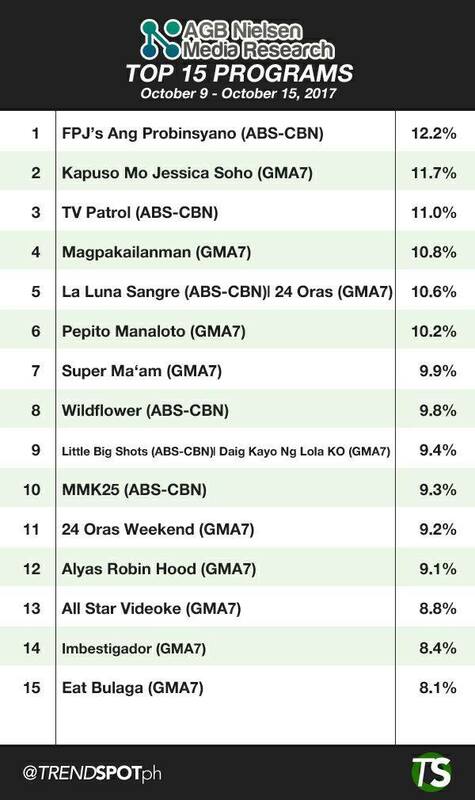 Led by Ang Probinsyano, Kantar Media rankings for the week is filled by ABS-CBN programs from the top to the number 10 position. Following Ang Probinsyano in Kantar Media leader's board is TV Patrol with 37.8% beating rival 24 Oras's 21.6% which landed in the 12Th position. Wildflower took the 3rd spot with 33.8% and La Luna Sangre in 4th with 33.6%. Kapamilya kiddie talent show Little Big Shots, meanwhile completed the top 5 with 31.5%. 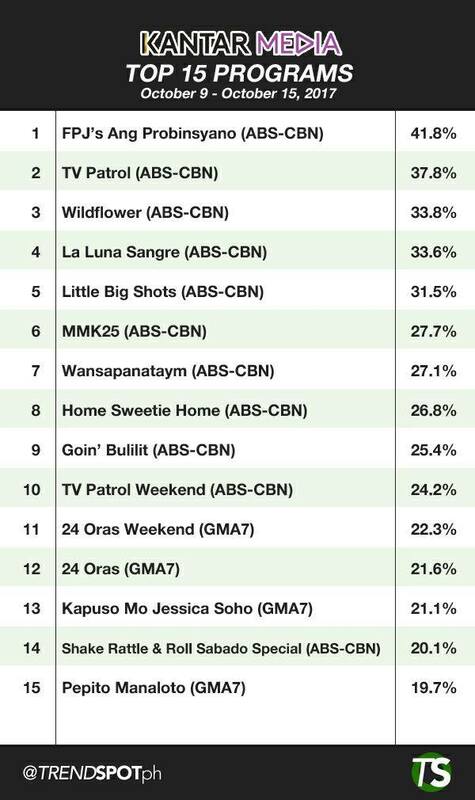 Other Kapamilya programs in the top 10 are MMK 6th, Wansapanataym 7th, Home Sweetie Home 8th, Goin' BUlilit 9th and TV Patrol Weekend ranking 10th.